Cash Flow is the money coming in from income and going out from expenses on a monthly basis. Effectively managing your cash flow is critical to put you in control of your money rather than it being in control of you. Cash flow management and planning is one of the key foundations to your overall financial planning strategies now and into the longer term. How much you need to live on today is often not reflective of what you will need once you reach retirement. As you will have time on your side which may result in the desire to spend more funds on travel and lifestyle. 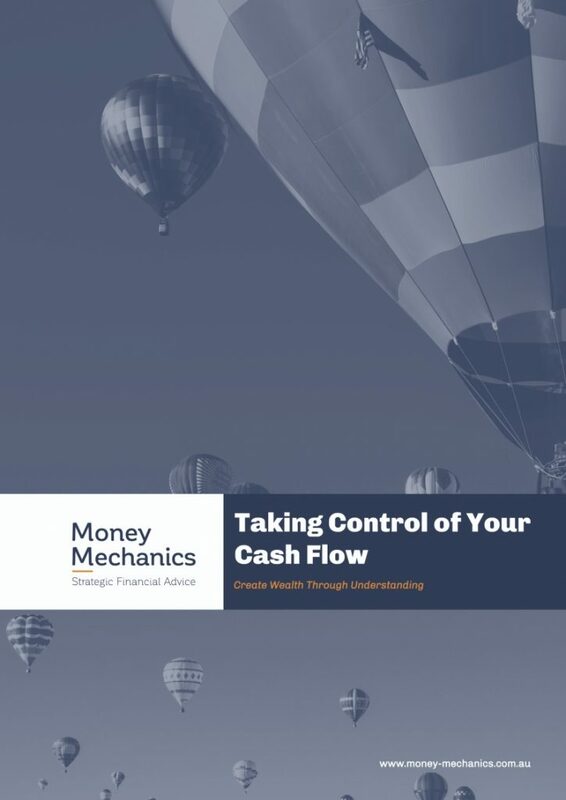 Money Mechanics can assist with the following to get your cash flow in order. Set up a cash flow framework and budget to manage your money. Create a savings plan to achieve your financial goals. Budgeting is about having an understanding of how much money you have coming in and how much is going out. This doesn’t always have to be a formal written document (although this does help), however, knowing your lifestyle is an important foundation step to your future financial plans. There are a number of great resources online to help you set up and manage your budget. For example Moneysmart is a great site and has a budgeting template. Once you have completed this, you will know what your financial position is each month and we can work with you to manage the difference, whether it’s to save, invest, or structure your finances to effectively manage debt. If you’re able to save money each month, we recommend creating a savings plan. You can find a savings goal calculator online to help with this process. We suggest a Three Account Structure (plus additional accounts for any long-term savings or investment which carries ongoing expenses) to give you transparency and control over your day-to-day cash needs. This account should be used for your day-to-day expenses such as food, lunches, coffee and entertainment expenses. The discipline here is once the funds are used you do not spend any more money on these items. This should be your standard working account with ATM access. 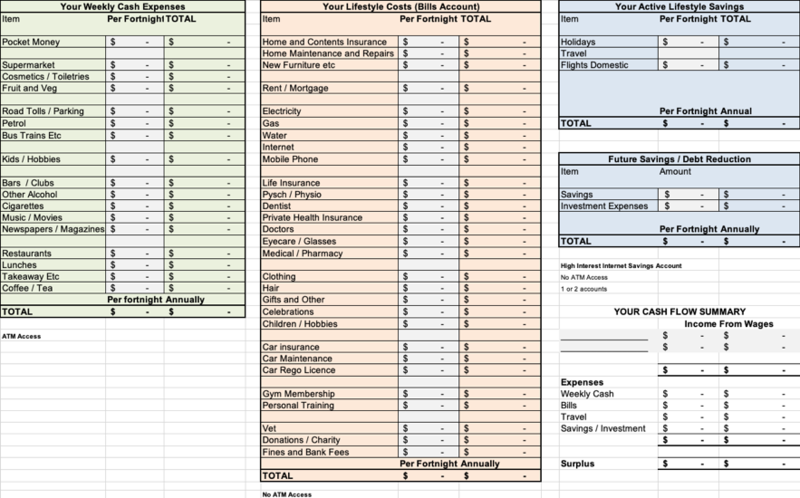 Use this account to plan for your regular annual expense and bills. Again each fortnight you should work out an amount to go into this account. The process here is if you are going for a haircut, or clothes shopping transfer the money across from the Bills Account to your Working Account, try to limit impulse buying and have a plan / purpose in mind when you go shopping. This account ideally should be an offset account if you have mortgage debt and you should have NO ATM access on this account. The idea behind this account is to save for regular lifestyle things. The fun stuff like regular holidays etc. This again if you have a mortgage should be offset account number 2 for the travel savings and NO ATM Access. Check out www.ingdirect.com.au, www.rams.com.au, www.rabodirect.com.au, www.mebank.com.au and www.ubank.com.au for High Interest Savings Account (HISA) to compare the best interest rate for your savings. Start by downloading your transactions from your bank account over at least the last 4 months. Include all your income and expenses. Keep any investment related costs separate so you can be clear on lifestyle. You’ll need to decide if your budget will be done on a weekly, fortnightly or monthly basis. As a tip most people like to match this to their pay periods. If monthly pay is too long consider paying yourself on a weekly basis as a drip feed for your weekly cash account number 1. The below is our suggested structure for your cash flow including labels for various types of expenses which fall into each account. Include elements which are a part of your lifestyle and add items which are not included. Basic expenses are sometimes non-discretionary in nature, meaning we have little choice over spending the money. Discretionary expenses we have more choice over how much we spend. Food can fit into both categories as we have to spend money on food in order to eat, however we have choice on how much money we spend and where we spend that money. Account 1 Your Weekly Cash – a few key items in this account are ‘pocket money’- which is money that you can spend no questions asked. ‘kids or hobbies’ are regular weekly expenses for your children’s activities or for regular hobbies you have. Account 2 Your Regular Bills – a key item in this account is the ‘home maintenance and repairs’ and ‘new furniture’ which is the emergency buffer for expenses around the home. Consider having a buffer account if you drive an older car or have older appliances. Overtime you will need to spend money on repairs and maintenance. The amount you allocate will depend on the size of your home and number of appliances you have. Account 3 Your Travel Account – This account can be a great way to mix finances for the first time. If you are in a new relationship or just want to keep things separate. A joint account which is focused on something fun that you both enjoy can be a great way to start to experience how you each engage with money. Account 4 Your Future Savings or Debt Reduction – Whatever is left in your budget should be going to future savings or debt reduction. See our tips below if you are not in surplus. If you have investments we suggest you have an account to manage each one. This provides transparency over the costs overtime so you know how things are really performing.